Boat lifts are used to hoist and hold a boat out of the water. A variety of boat lifts have been used in commercial shipping since the late 1900s. Boat lifts were originally referred to as davits. A davit is a crane like mechanism that is mounted on a sea wall, which is attached to a boat at the bow and stern to lift and suspend the boat above the water. Boat lifts were introduced when people discovered that a davit will cause damage to their boats hull. These boat lifts or boat hoists reduce damage by lifting from the bottom, and are powered manually, electrically, or hydraulically. They have become increasingly popular within residential applications and are praised by their users for their ability to mimic dry storage. Why People Use Boat Lifts? Boat hoists, also known as davits, are the perfect alternative to keeping ones boat in dry storage. People choose boat lifts to protect against marine growth, and to protect the gel coating of the bottom of their boats. 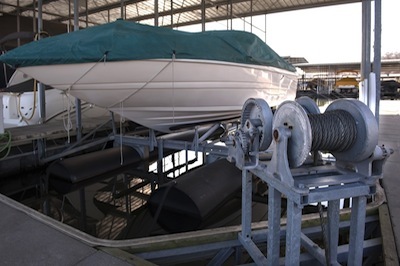 What are the Drawbacks of a Boat Lift? 1. Permitting – Permits are often required which can increase the cost, and significantly delay the process of getting your boat lift installed. 2. Dredging – To accommodate a boat hoist in many cases, dredging is necessary, which can be costly, and can require permitting that can delay installation. 3. Accessibility – Even with dredging, some locations may not be conducive to loading and unloading a boat from a boat hoist in low tides. Access to the boat lift can be restricted for boarding, cleaning, and covering. 4. Expensive – Boat lifts can cost anywhere between $10,000 and $100,000 and frequently include substantial unforeseen costs. 5. Electrolysis – Faulty electrical lines often create a hot system that can deteriorate most metals and can require many costly zinc anodes to combat the electricity. 6. Raising & Lowering – Operating the boat lift can be a very slow task, and is not ideal for quick day docking situations many boaters will encounter. 7. Loading – Most boat hoists are not easily accessible, and one can be injured while maneuvering between the dock and the boat lift. 8. Restrictions – Many marinas and condo associations have placed restrictions on mechanical boat hoists that can alter the existing dock structure or impede the view of neighbors. 9. Environmental – Installing a boat lift can cause some materials to rot, rust, or leak harmful chemicals into the water. Also the large boat lift mechanism can require cutting into protected mangroves. 10. Maintenance – Boat hoists can frequently require maintenance that may demand professional expertise. Will a Boat Lift Protect My Boat in Severe Weather? Boat lifts can typically endure lesser storms, but as the storm escalates in severity the chance of failure significantly increases. What happens is during high winds the boat can swing with the cables and can damage the boat or dock. In the event of storm surges that result in flooding the boat will likely rise with the water level, and can be swept away or damaged. Ultimately, during severe weather it is understood that a boat hoist can be the worst place to keep your boat (see this article from BoatUS). SlideMoor takes the guesswork out of tying up your boat, solving many of the docking and mooring issues encountered by boaters. SlideMoor works much the same as a floating dock. It secures your boat tight with two lines on one side only, eliminating bumping, banging, and other damaging movements. SlideMoor allows your boat to move securely up and down through waves, wind, and tides. We have glowing testimonials from clients who had their boats survive Hurricane Katrina and Hurricane Sandy, where all other docking systems failed. We provide a proven solution to holding your boat that is both cost effective and will not require permits.